Many of you know that my mom, Laura, is a pretty spectacular cook. She is the person behind most of the recipes we share on About a Mom. This time of the year, when it’s cold outside and we are rushing around to finish holiday shopping, there isn’t much I enjoy more than a bowl of Grandma Laura’s lentil soup. It warms the soul and brings that comfort we so crave on a cold dreary day. I could eat a bowl of soup for dinner every day this time of the year. It’s the perfect holiday comfort food. Fortunately, it’s easy to make a pot of homemade soup if you have a few essential ingredients like a can of tomatoes and some beans. Or if you’re spoiled like me, you have your Mom make a pot of soup. 1. Heat olive oil in a large saucepan, and saute carrots, celery, and onion until just tender. Add the finely minced garlic and saute an additional minute or two. 2. Add tomatoes, lentils, broth, and salt, pepper, and Italian seasoning to the same pot. Bring to a boil, reduce heat and simmer for approximately or until lentils are tender. Add additional chicken broth or water if necessary, until you have achieved the desired consistency. What’s your favorite holiday comfort food? You’ll love this fun video where Meg Ryan (wink) shares her famous spaghetti sauce recipe! Contadina’s ‘Somewhat Famous’ comedic video series is a funny spin off celebrity reality shows, and takes viewers into the kitchens of real moms, who happen to share the same names as A-list celebrities. Every mealtime masterpiece starts with Contadina and ends with a clean plate. Our mission is to gather families together around the dinner table with our delicious, Italian-style recipes and carefully-sorted Roma-style tomatoes. Disclosure: Compensation was provided by Contadina via Glam Media. The opinions expressed herein are those of the author and are not indicative of the opinions or positions of Contadina. This looks good. I’ve never had lentil soup before. And my favorite comfort food over the holidays are any sort of sweets. So bad, I know. I bought a bag of beans last week, and had on my list of things to do to search for a recipe. Thanks for saving me the search. Better yet is I thought I’d need a ham bone, glad to know I don’t. Wonderful recipe! Thanks for sharing! I love lentil soup. This sounds delicious! This is definitely a keeper! I have been looking for a soup recipe like this. Thanks for sharing your special recipe. This looks like a great recipe. I love having soups this time of year. They are currently my favorite meals. I can’t think of a favorite holiday food. But I can think of 100’s of treats. This is the perfect recipe for a cold winter day! This sounds amazing! It’s so chilly today.. this would be the perfect comfort food! I have never had lentil soup before, this looks amazing. I would love to make this for my family. I’ve never made anything with lentils before, but this soup looks amazing. I would definitely like to try it. Yum that looks delicious! I could totally eat soup every day for dinner too but the rest of the family are not big soup fans unfortunately. I pinned the recipe to try later, thanks. I am going to start eating healthier – I need to make this (because lentils are a good food). Yum yum yum! I love soup in the winter time and eat it almost every day. Lentil is one of my favorites! I will try making your version — looks easy and good! I have never had Lentil soup! It sounds really good though and looks SUPER tasty!! This looks SO tasty! One of my friends hosted a dinner party not long ago and served Lentil Soup. I asked her for the recipe, but of course she never gave it to me! This sounds super similar so I am going to try it out! Thank you! That looks delicious and nice and warm! Perfect! I love lentil soup with lemon, so, so good. As far as a favorite holiday recipe, I don’t know! It’s hard to pick just one. I guess I consider mashed potatoes a holiday recipe so that’s my vote for favorite! I love a bowl of hot soup. Perfect to drive the chills out on a cold winters night. I’m not big on beans. Wonder if I could adapt this to have a different base? I would just try adding more veggies, instead of the lentils. I don’t think I have ever had lentil soup but it sounds yummy! This soup recipe looks amazing! It is so cold here I would love to curl up with a hot bowl of soup. Your lentil soup looks fantastic. I have got to make this…It’s so healthy and good for you. A nice and refreshing change from a meat-based soup. This sounds so good on a cold day or night! This is an awesome recipe and perfect this time of year when we crave soup! I love lentil soup. It never looks super appetizing but it sure tastes delicious. That lentil soups looks tasty. I love warm soup on a cold winter’s day! I like this! It looks very rich and hearty, just what I need in the cold weather. I’d have this with a nice chunk of crusty Italian bread. My go-to comfort food is usually mac and cheese, but you may have won me over!! I’m going to give this a try tomorrow! I have all the ingredients in my house. We love lentil soup. That looks so good, Angela. I love a bowl of steaming soup when it is cold. That looks so warm and comforting. Would be a great dish for winter. This looks like such a delicious recipe! I have never made lentil soup before. This sure would hit the spot on these frigid days!!! I will have to try it! I LOVE lentil soups!!! YUM! I love lentils mixed in with lots of soups! Soups are great for winter time. i still remember my first time trying lentil soup. i was hooked. so delish. and good for you.and i want some now! Do you know, I’ve never had lentil soup. But I am all for trying any soup that looks so yummy and warm, especially with the cold 20-degree-days we’ve been having! Lentils are huge in my house! Lentil soup always reminds me of winters at home with my mom. I’m so glad my kids like it! This looks really really great. My oldest loves lentils and I don’t know how to make it. His nanny use to make it for him when he was little and I would buy extra bags so she could make it for me as that is all he would eat. Its so good for you too. my mom makes this multiple times a week. i am indian so it is like a staple dish in almost every meal. i grew up on this and would love to try this recipe to see how it compares to my moms. My mom loves lentil soup so much! And so do I! Hey!!! Where was our dinner invitation. I love a hearty lentil soup. We have all been feeling a little under the weather around here, so a good bowl of soup would be wonderful. Definitely trying out this recipe. 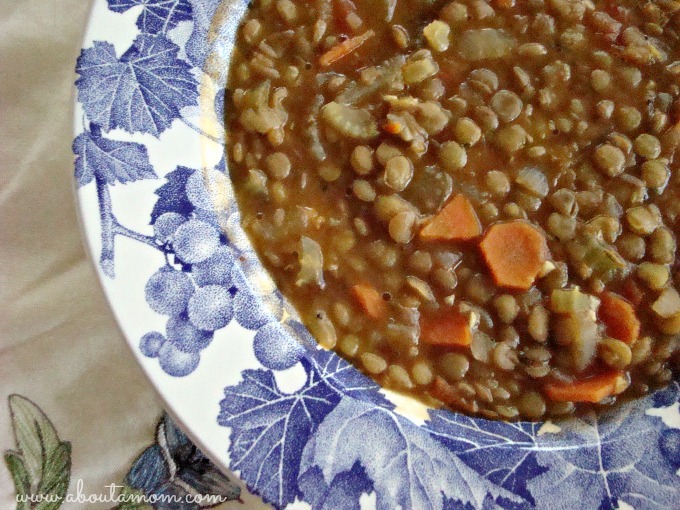 While Lentil Soup is not the prettiest meal, it is delicious…and lentils are so good for you! Yum! Thanks for posting! Family recipes are my favorite– especially around the holidays! This looks so great. I have never had lentil soup!! I discovered lentils a couple of years ago and they really are delicious. Her soup looks crazy yummy! My hubby would LOVE this, thanks for sharing! My husband loves lentil soup, so I will try this. Lentil soup is super satisfying on a cold Winter Day. I can’t wait to try this recipe out. My comfort food is stuffing and gravy. And leftover gravy & stuffing. Your mom can make me soup anytime. I love matzo ball soup! Just the other day, my husband was craving lentil soup and he whipped one up, but he wasn’t really happy with it. I am definitely going to pin this recipe to try the next time we are in the mood for a good soup. I am ashamed to say that I have never had lentil soup. But it sounds so good and I can do this recipe. Thanks for sharing! I love lentil soup. I have never had lentil soup but this looks delicious!! My go to comfort food in winter is either potato soup or ham and bean!! My family loves to make a big pot so we have leftovers!! I’m like you – I could eat soup every night for dinner when it’s cold out like it has been lately. I’ve been alternating between potato and chicken noodle soup for the past couple weeks, but I might need to work this one into my rotation! Oooh, this is right down my alley and perfect for this awfully cold weather we’ve been having! It’s been years since I made this ….your recipe sounds wonderful! This soup looks like it would hit the spot on a cold winter day. The lentils don’t need to soaked overnight. It’s part of the beauty of this recipe. Brings back memories of when my Mom made Lentil soup .It is the same , wow!! She also made pasta and added it to the soup. Delicious!! 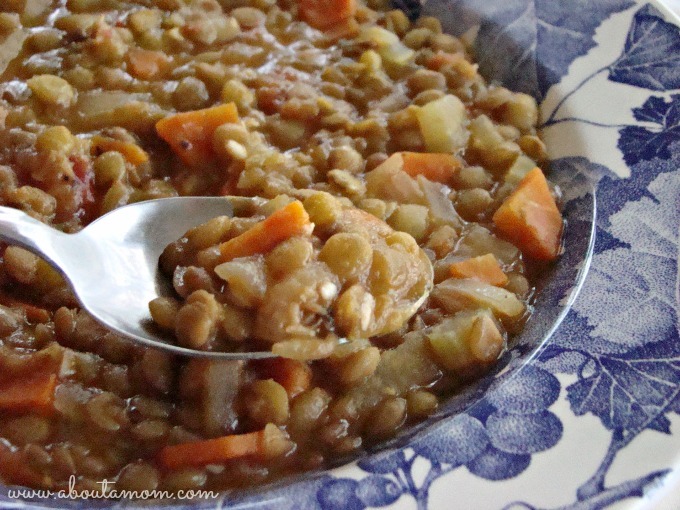 I love Lentil Soup and this is the best soup recipe I have ever seen! I like hot soup as a comfort food, and I like Chicken and Dumplings that my sister makes for me every year! I need to make this recipe soon! I love lentils. This soup looks so good and I bet with some bread it would be the perfect cold day meal. This looks so appetizing. Would be great on a cold winter night! I love soup of almost any kind and this lentil soup looks really good. It’s been many years since I had lentil soup or anything made with lentils actually. I would probably add ham or maybe beef to it since I like meat of some type in my soup. Thanks for the recipe. I had lentil soup for the first time this year when my sister gave me a recipe. I will try your recipe because it is a little different, and it looks so good!! This looks delicious!! Usually when I make lentils I just boil them and season with salt ans pepper, I’d love to try Grandma Laura’s recipe. My favorite Holiday comfort food is pie. This looks so good especially this time of year in this cold weather. I really want to try this one thanks so much for sharing this recipe I am using lentils more and more. I love trying new soups and this one sounds wonderful. I can’t remember ever trying lentils and this would be a great way for me to give them a try. I’ve been on a lentils kick, and haven’t made soup yet (how can that be?). I don’t know, but I’ve been having them as a side dish with mashed potatoes, etc. I love how it doesn’t take that long to cook them, unlike beans. This soup sounds fantastic, no ham bone needed! I want to make this tonight!